In this world, you’ll come across two types of people. Either they’ll be the ones who love to shop, or hate to shop. Which one are you? Well, even if you don’t like shopping, you’ll eventually have to do it someday or another. In this consumer-driven era, we receive messages and see ads every day that try to convince us to buy their products – this is what has made retail marketing so tricky. Thanks to digital marketing techniques, e-commerce businesses have grown and seem to take up most of the market share from retail business owners. According to Big Commerce, around 96% of Americans have made an online purchase at least once. On the other hand, 51% prefer to shop online. Therefore, if you are still running a brick and mortar store, how can you convince customers to step out of their homes and come to you. If you think traditional marketing techniques for retail businesses like publishing ads in magazines and newspapers will still work, then you’ve got to move on. Well, you’ve got nothing to worry about now! Here are our seven killer retail marketing tips to increase the sales of your B2C or B2B marketplace all year long. You are aware of the fact that people now prefer to shop online, right? Well, as a retail business you can still capitalize on this opportunity without having to shut down your brick and mortar store. Also, you don’t have to create your e-commerce platform as well. Instead, all you have to do is invest in running Google shopping ads. Billions of searches are made every day, and they love to use Google to shop. Create a beautiful and engaging ad copy to experience tremendous results. Also, always target your best products at the best prices to witness a boost in your B2C or B2B sales. I’m pretty sure by now you already have some social presence. However, if you understand the potential of this digital marketing technique, you’ll invest all into it. In 2019, the global social media user count is expected to go past 2.75 billion. Imagine if you can get even get 2% of these users to view your products. Well, with the right ad copy and plan, you can quickly achieve that. However, the competition is pretty high on this platform. Therefore, try to target your ads on products that are your top sellers and make sure that you mention complete contact details and your business address so that your consumers know where to come. You could also offer a special discoun to all those users who come down to your store to buy something. – Discounts are always great magnets to lure foot traffic to your store. 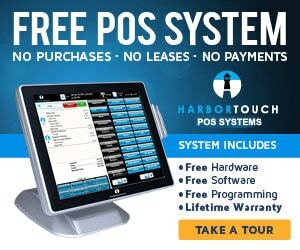 A modern retail POS system like Harbortouch Checkout offers social media marketing and discount features to help consolidate your advertising efforts. Yes, there is a world outside of the digital marketing environment. You don’t always have to invest online for your business. In retail marketing, people who think out of the box are the real winners. Therefore, one great way to attract the audience and get noticed by people while they are living their normal lives is guerilla marketing. Guerilla marketing is a creative and modern way to promote your brand or products on the streets or other public places. The costs of this strategy differ as they depend on the location and city you target. For example, painting a bus stop with your business theme, mascot and logo is a great way to get noticed. However, stunts like these always require permission from the local authorities and may cost you a pretty good amount. – A pretty effective retail marketing strategy! No better way than to bring your products to life. Do you even know how many kids wished for a Buzz Lightyear action figure after the first Toy Story movie was released? Well, the demand for each character exceeded 2 million as soon as the film hit theaters back then. This story proves that once you bring your product to life, people will show more interest in buying them. Now that doesn’t mean that you should make a movie for your product. However, you can produce short video clips that are related to the performance or specifications of your products. For example, short tutorials or product review are great to boost the credibility of your products. Even a simple video that shows what your store has to offer can lure many customers to your doors. Nowadays, many B2C and B2B marketplaces are dedicated to listing businesses on their platform. The primary purpose behind these networks is to feature enterprises from around the world on their website – this can help you find many buyers and suppliers that belong to your industry. All you have to do is signup to these networks. Once you’re done, you’ll be connected with thousands of clients. Though this technique works online, as a retailer you can still receive bulk orders from buyers providing you with an opportunity to enter the international market. Some of the leading lead generation companies to trust are, Alibaba, ExportHub, and DHgate. Have you ever noticed that you could find a national day for just about anything? Ever thought that there might be a Donut Day or a Pancake Day? Well, there are! However, that doesn’t mean that you should celebrate them all. Instead, you should focus on days that are either related to your product or can help your ad campaign become more active and use these days to your benefit. Also, never miss the popular ones like Valentine’s Day or, Saint Patrick’s Day. All industries have their ups and downs. That means, someday you’ll see customers flying into your store, while another day people will walk past your doors. Although, usually all business have their peak season when their sales increase rapidly. For example, you’ll always see people traveling more during summer and winter breaks. The demand for flight tickets increases causing a rise in the prices as well. Figure out your peak seasons and start planning your ad campaigns accordingly. – Even a slight touch of a theme that is related to that particular season can help your business experience growth throughout the year. Retail marketing isn’t as easy as it was. However, with the help of digital marketing, the costs have significantly dropped. Though that may be a plus point for you, many retail marketers fail to capitalize on this strategy. The tips mentioned above are crucial in helping your business grow. With these killer retail marketing tips, you’ll witness your sales increase throughout the year.